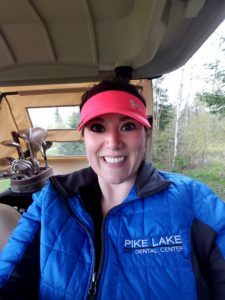 Lisa sporting her Pike Lake Dental jacket while golfing last week. Last week I was golfing in my women’s league and I had the pleasure of meeting a couple of wonderful new ladies. I was stylishly sporting my Pike Lake Dental jacket (Thanks, Dr. Matt! 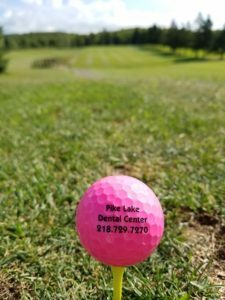 ☺) and one of the ladies said, “Oh, hey – Pike Lake Dental! You guys make oral appliances for sleep apnea! We both work at the Sleep Center.” I felt very proud to be working in an office that they were familiar with for aiding in the treatment of their patients. We do make some great oral appliances for the treatment of sleep apnea, and I’ll get to that shortly, but first… What IS sleep apnea? A view down the green. seconds to over a minute each and can occur a few times per night or, in severe cases, hundreds of times per night! There are three types of sleep apnea: Obstructive Sleep Apnea (OSA), Central Sleep Apnea (CSA) and Complex or Mixed Sleep Apnea, which is a combination of both. OSA is the most common form of sleep apnea and the type that we’ll focus on here. OSA is caused by an obstruction, or blockage, of the airway. When a person with OSA sleeps, particularly on their back, the muscles in their neck and throat relax. The lower jaw also relaxes and the tongue can fall back against the back of the throat, or soft palate, restricting the airway and reducing the amount of oxygen that can reach the lungs. The only way a sleep apnea episode ends is by the person waking up, often times with a loud snore or choking sound when breathing resumes. What are some symptoms of untreated OSA? If left untreated, OSA can have some pretty nasty effects – heart attack, stroke, high blood pressure and depression, just to name a few. A physician will likely order a sleep study to be done for a patient exhibiting signs of OSA. The patient typically spends a night in a Sleep Lab or Sleep Center with medical equipment monitoring their sleep patterns. There are a few options for treatment, depending on the severity of the disorder. Sometimes behavior changes such as losing weight, changing to sleeping on one’s side, and avoiding alcohol and smoking can treat a mild case of OSA. With a severe case of OSA, a CPAP (continuous positive airway pressure) machine is often the best treatment to maintain the patient’s airway. Now, somewhere in between the previous two, there is the “mild to moderate” case of OSA. Here’s where we, as dental professionals, come in. 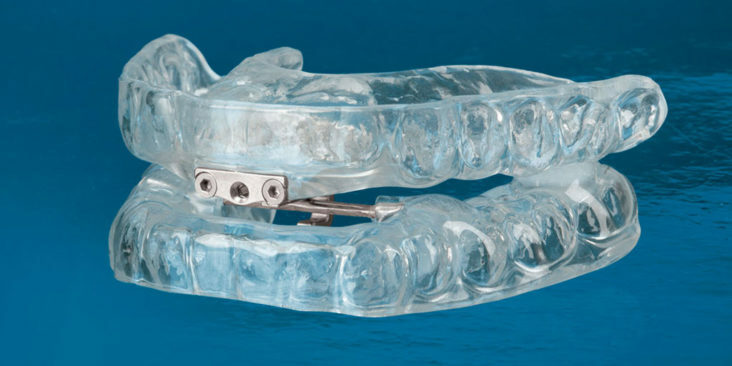 For this type of OSA, we can make a mandibular advancement splint to keep the airway open during sleep. Wait… a what??? A mandibular advancement splint. An example of a Tap3. Impressions are made of both the upper and lower teeth and a recording of how the teeth bite together is taken, along with a measurement of how far the lower jaw can be moved forward. We then have an appliance fabricated to fit very precisely to the teeth. The appliance is somewhat like a close fitting mouth guard for the upper and lower teeth with an attachment in between to keep the lower jaw in an advanced or protruded position, therefore keeping the airway open. This appliance allows for more freedom in sleeping position than the CPAP machine and is also free of the constant noise. We often hear patients say how they have been diagnosed with sleep apnea and have tried a CPAP machine, but they are just not able to adjust to sleeping with it. Does this sound like you or someone you know? The Tap3 Oral Appliance just might be an alternative option!